Re: Beaded mini horse from India ??? -- Karlis Post Reply Edit Forum Where am I? Just a little clarity with regard to Ikat production: the pattern is not 'printed' onto the threads (I don't know how that would be possible in traditional weaving techniques). It is resist dyed into the warp thread (tie-dyed just like the tee-shirts of the 70s). I live for part of each year in a silk-weaving village in Isaan in Northeastern Thailand. 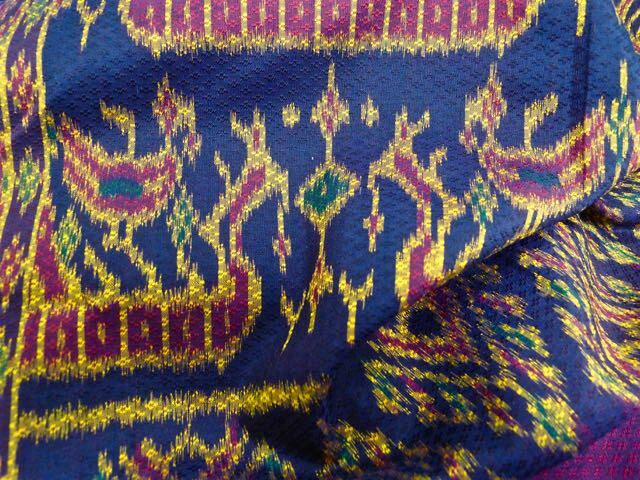 The Thai word for Ikat is Mutmee. The production process for Mutmee is painfully time-consuming, from the first stages of raising your silk worms, through the preparation of the thread, to the dyeing itself. I'll attach a photo of some silk thread that a friend who has been weaving for close to fifty years let me have. 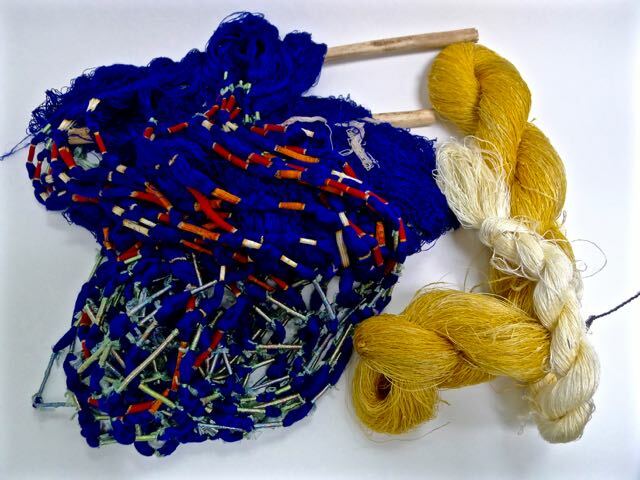 On the right the yellow hank is the rough thread that hasn't yet been washed; it's hard, almost rope-like. Next to it is a hank of white washed thread which is beautifully soft and silky. Then on the left of the photo is the thread that has been dyed. Each element in the pattern has to be dyed into the thread, with the other sections of the pattern carefully bound off to keep the dye from spreading. You can see how carefully the covering thread is wound; in some places it has been untied and in others it still covers the underlying colour. As I watch my neighbours doing this I'm amazed by the patience, and also by the relaxed pleasure they get from it. The thread in this first photo is for a relatively simple modern design, which is why my friend was ready to give it to me. Even then, there are at least a couple of weeks' work behind it. The finished silk in the second photo is a different matter. It's an old 'royal barge' design of ceremonial boats with nagas and hamsas. The woman who made it worked on it for more than a year. Incidentally, not all Ikat is made with the pattern dyed into the warp. There are weft-dyed patterns, too, but they are much cruder. And then there is double Ikat, the most complicated of all, where the pattern is resist-dyed into both the warp and the weft; it requires tremendous precision and memory to pull off successfully.